Throw pillow covers are the easiest and most affordable way to make seasonal decor changes in your home. This amazing list of fall covers are all under $30 and are sorted by color! What is the fastest, easiest and most affordable way to make seasonal decor changes to any room in your home? Why, by using throw pillow covers of course! Pillow covers are usually less expensive than buying a complete pillow. An added bonus is that you don’t have to purchase a special pillow form – you can just slip them right over pillows that you already own. Win!Win! I’ve put together an assortment of pillows for you so that you can choose your favorite fall color and mix and match to your heart’s content! Whether all the pillows are on the sofa together or scattered throughout a room, these patterns will look great mixed together. These would look amazing mixed in with a few copper accessories such as a set of copper canisters, copper bowls stacked together and a copper teapot. During the fall, rich red leaves are found on Red Maple, Sourwood and Japanese Maple trees. The beauty of soft yellows can be found on Aspen, Ginkgo and Tulip Poplar trees during the fall. During the fall, burgundy mums are everywhere. You’ll find burgundy leaves on Sumac, Chokeberry and on Viburnum. More beautiful fall color can be found in rusty orange mums, Sugar Maples and Fothergilla trees. What are your favorite colors to decorate with for fall? Did you find a combination that you like? Pillow posts are one of my favorites! Oh you find the most fabulous pillows! I love the copper colors. Thanks for sharing and enjoy your day. I love throw pillows. I have so many seasonal ones. I can’t wail to get them out. Wow – this came just at the right time. I need to update my porch pillows now! Now just to decide! Thanks for doing all the leg work and getting me going on this! Great Fall Colors! Gets me Excited for Halloween! Love the copper! Doesn’t match in my house but I love it anyway! So pretty! Love the deals on those Calitime covers! And they have LOTS of different designs! Thanks, Suzy! 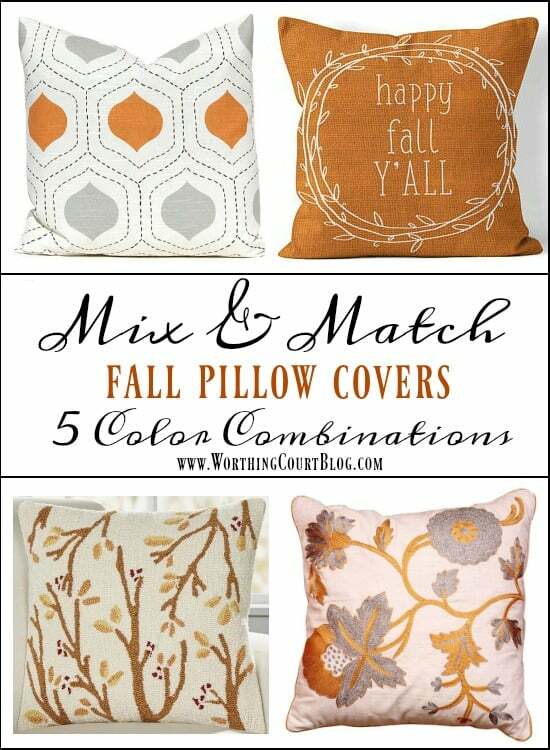 These are great fall pillows and great color combos! The orange bunch are perfect! I’m loving these. I love Fall colors all year round! Luv this blog post! I literally went out the next day to Home Goods and TJ Maxx trying to find new pillows to decorate my couch for fall! Thanks for the inspiration! Lovin’ the pillows you featured here, especially the burgundy! New to your blog site. Many good reads and ideas . Copper is one of my favorite Fall colors. I have copper accents in my kitchen since I also use rubbed oil bronze for my lamps and kitchen faucet fixtures, so these pillows really speak to me! Plus, I am a “pillow” person–really love to use pillows to change up the seasons. Thanks for these finds! I also love the pillow covers. And the fall colors are me. I use these colors all year round. Thanks for all your great idea! thanks for reminding us to comment. I love the fall pillow covers, especially the one that says Happy Fall, and the one to the left that has the grey and orange leaves. Love the orange, great Fall colors! We are remodeling our 20yr old home and I can’t wait to use some of your great decorating ideas! I don’t usually decorate much with orange or copper, but those pillows are so great. I like the copper for a more subdued orange feel. I agree that throw pillows can change the entire look of a room. It has to be the easiest decor change for each season and holiday. I like the orange pillow combination. The “Happy Fall Y’all” is darling. The copper pillows really give the fall feel.